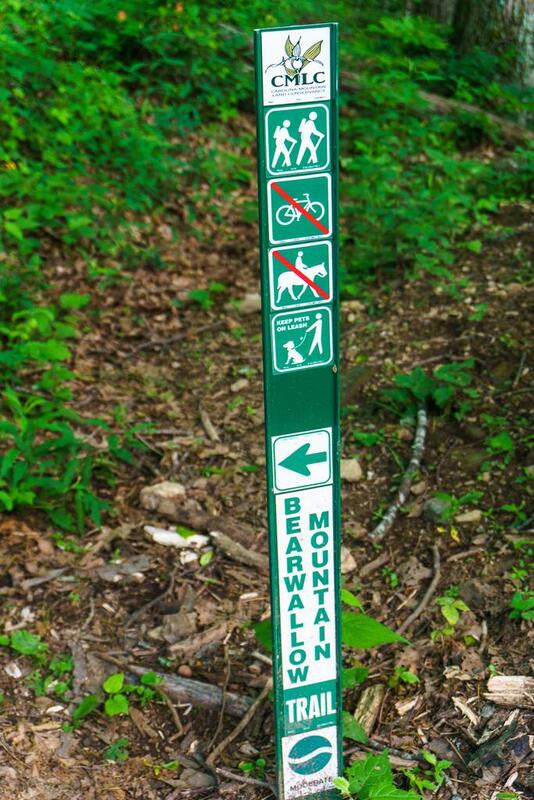 Bearwallow Mountain, which is privately owned, is located in northeastern Henderson County, towering above the Hickory Nut Gorge, Chimney Rock, and Lake Lure areas. 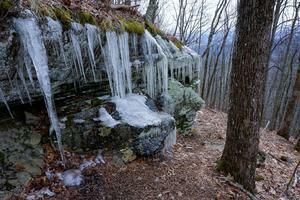 Straddling the Eastern Continental Divide, the mountain has been a popular destination for local hikers who knew about it for years. Now, thanks to a conservation easement on the land and a beautiful new trail leading to the top, it's been officially opened to the public for hiking. 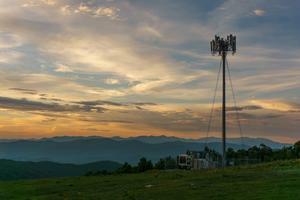 View west from Bearwallow Mountain at sunset. 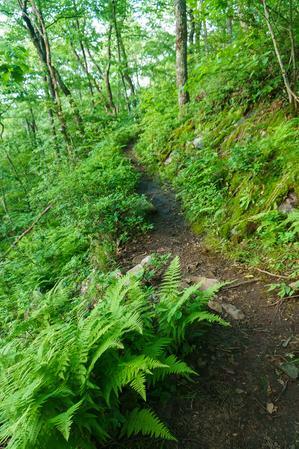 The Bearwallow Mountain trail traverses this ledge,which is covered in ferns in the growing season. 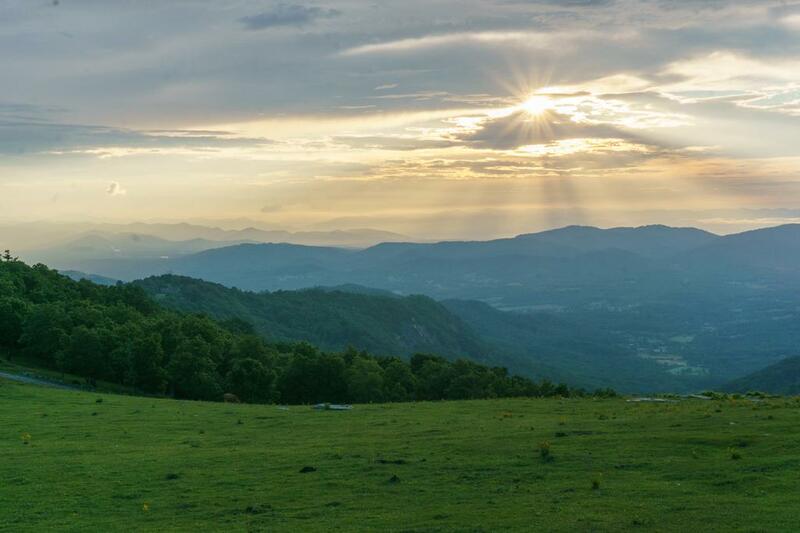 The mountain rises to 4,232ft above sea level with a signature open pasture on its northwest slope, visible from miles away in Fairview and Buncombe County. The rocky, grassy summit, which you share with friendly grazing cattle during the summer, provides expansive views from the south to west to north. Mountains visible include Mount Mitchell, Mount Pisgah, and the Balsams. You can see much of rural Buncombe and Henderson Counties and the Asheville area as well. 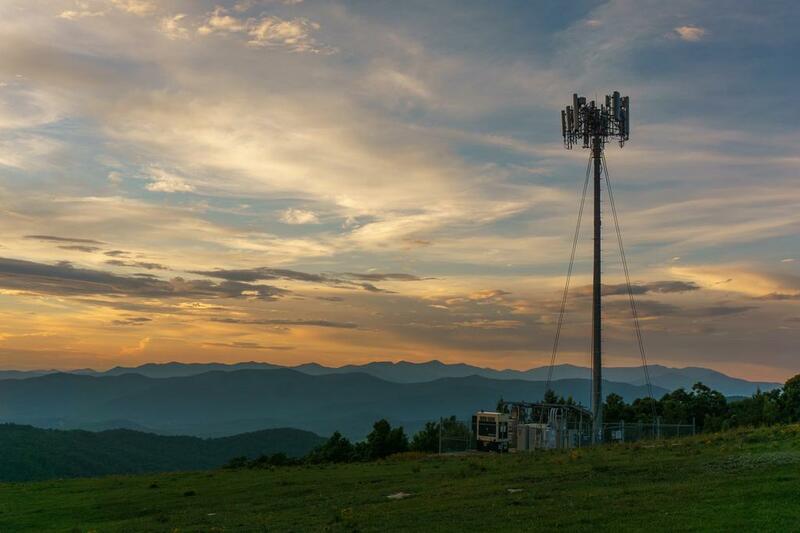 At the summit, dozens of communications towers have been constructed around the historic yellow NC Forest Service fire tower and house which was used to keep an eye out for forest blazes in years past (see the link above for a great story about the tower and its history). You can't climb the tower now, but as a child, I remember visiting the mountain and spending time at the top speaking with Mr. Curtis who staffed the tower and was eager to share his knowledge about his job with visitors. Public access to the mountain was secured with the help of the Carolina Mountain Land Conservancy (which is primarily responsible for the conservation easement on the land), the Carolina Mountain Club, REI, and volunteers from the community. 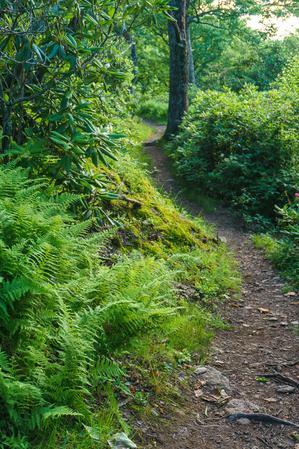 According to CLMC, 81 acres of land were protected in 2009, almost 500 acres of land are hoped to be protected in the future, and the trail will eventually become part of a much longer one connecting to the Florence Preserve and trails in the Hickory Nut Gorge and Chimney Rock State Park. Many thanks go out to these organizations who work hard to protect the unique places in the mountains we love to visit! 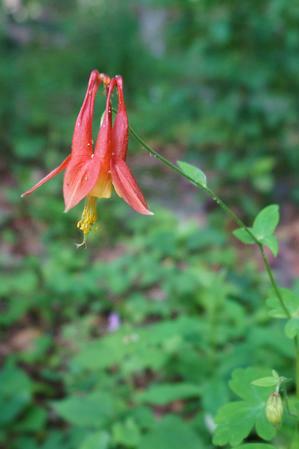 For more information, visit the Carolina Mountain Land Conservancy's web site. 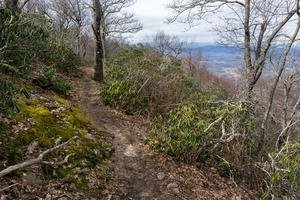 Right now, there are two excellent trails at Bearwallow Mountain. In the future, another trail is expected to be built on the back side of Bearwallow Mountain, and all three trails are expected to be parts of the longer trail network circumnavigating the upper Hickory Nut Gorge. 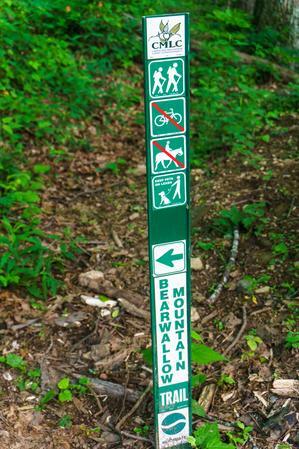 For now, the main attraction is the Bearwallow Mountain Trail. The trail is beautifully constructed with some nice rock work. It begins behind the old metal gate on the Bearwallow Mountain Road parking area, to the right. It climbs earnestly, but never steeply, as it switches back and forth across the western ridge leading up to the summit. By combining it with the gravel road which was traditionally used as the route to the top, you can make a great loop hike up to the summit and back. 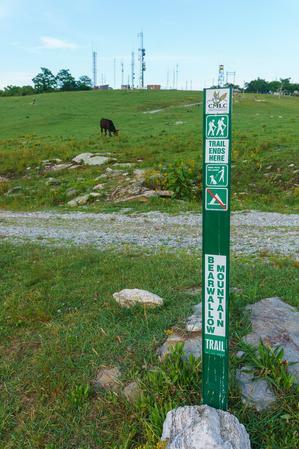 Also starting at the parking area on Bearwallow Mountain Road, the Trombatore Trail leads away from Bearwallow Mountain toward Blue Ridge Pastures. It offers fantastic views back to the summit of Bearwallow Mountain and a varied trail surface and surrounding forest environment. Here's a map of the Bewarwallow Mountain area. For more maps, including printed publications, see our Bearwallow Mountain maps page. Take I-240 east for about 3 1/2 miles and continue straight onto US Hwy. 74-A east. Follow 74-A east for about 12 1/2 miles (up a very long set of switchback curves) to the town of Gerton. Turn right on Bearwallow Mountain Road. The road becomes gravel, and gets steep and kind of bumpy, but passenger cars shouldn't have trouble making it except maybe in very severe weather conditions. Go about 2.1 miles to the parking area on the left at the rusted gate (where the road turns back to pavement). From the town of Lake Lure, it's about 3.5 miles west on US Hwy. 64/74-A to Bat Cave and the US Hwy 64 split. From this junction, go 5 miles West on 74-A and turn left on Bearwallow Mountain Road, and proceed as above. From the US Hwy. 64/I-26 interchange (exit 49) in Hendersonville, follow US Hwy. 64 east for 6.3 miles and turn left onto Mills Gap Road. Go 0.3 miles and turn right onto Bearwallow Road. Go 2.7 miles and turn left onto Clear Creek Road. Go just 0.2 miles and turn right, onto Bearwallow Mountain Road. It's 5 miles up to the parking area, which will be on the right at the rusty gate before the road turns to gravel.